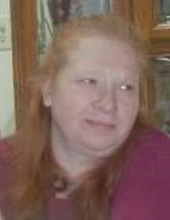 Diane Renee Flynn age 52 of Crivitz, passed away on April 1, 2019. She was born to Curtis Meier and Marie Desjardin on September 7, 1966. She attended Crivitz High School. After high school she worked at Saputo Cheese Factory for many years. She liked going to the casino, going fishing as well as going on road trips but she loved watching her youngest son play football and spending time with her grandchildren. She is survived by three children Brian (Theresa) Flynn, Michelle (Raymond Jose Jr.) Flynn and Wyatt Trever, six grandchildren, her mother Marie Jicha and step father George Jicha, three brothers Keith (Tonya Guns) Henson, Mike Henson and Troy Meier and one sister Kim (Jeff Higgins) Henson, boyfriend David Trevor and many nieces and nephews. She is preceded in death by her father Curtis Meier. The family will greet relatives and friends at the Rhodes Charapata Funeral Home in Crivitz on April 20th from 10-12 Noon the service will be at 12 Noon. Immediately following the service there will be a celebration of life at Thors Wolverine Den. To send flowers or a remembrance gift to the family of Diane Flynn, please visit our Tribute Store. Guaranteed delivery before Diane's visitation begins. Guaranteed delivery before Diane's service begins. "Email Address" would like to share the life celebration of Diane Flynn. Click on the "link" to go to share a favorite memory or leave a condolence message for the family.